Hi! I’m Alyssa, Annie’s youngest daughter. My mom let me be a guest blogger today. It’s my turn to make breakfast for my family. I chose to make fluffy vanilla pancakes. If my sister (when she was 3) could help do it, and if I can make this all by myself, then maybe your kids can make this too. It’s a fun way to get kids in the kitchen. Here’s how I did it. 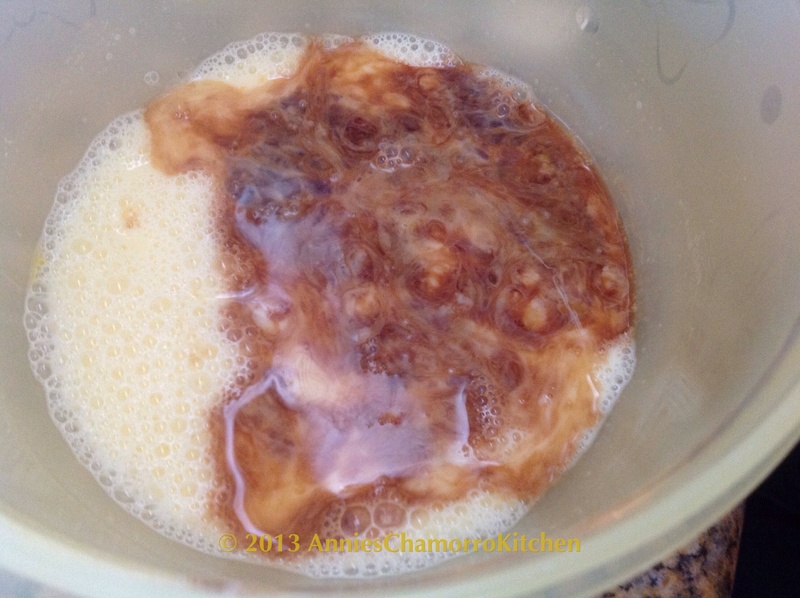 After you view all of my photos, you can find my recipe all the way at the bottom of this post. Oh, one more thing. This made 2 regular sized (big) pancakes and about 7 smaller pancakes (they were small, and a little bigger than dollar pancakes). 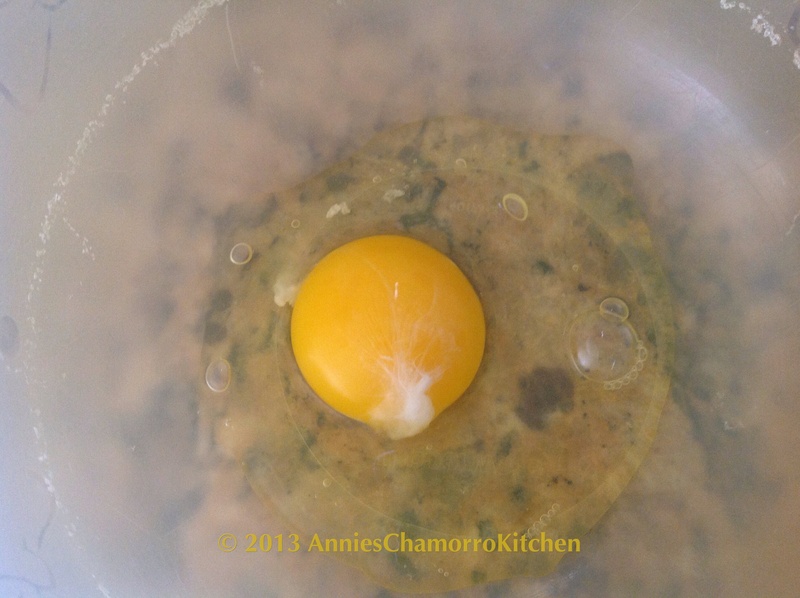 First, crack the egg into a small mixing bowl. You might not be able to tell, but the bowl I’m using is a Tupperware bowl with Minnie Mouse on it. My mom got it for me when I was around 3 or 4 years old, the same age my older sister was when she started helping my mom make pancakes. 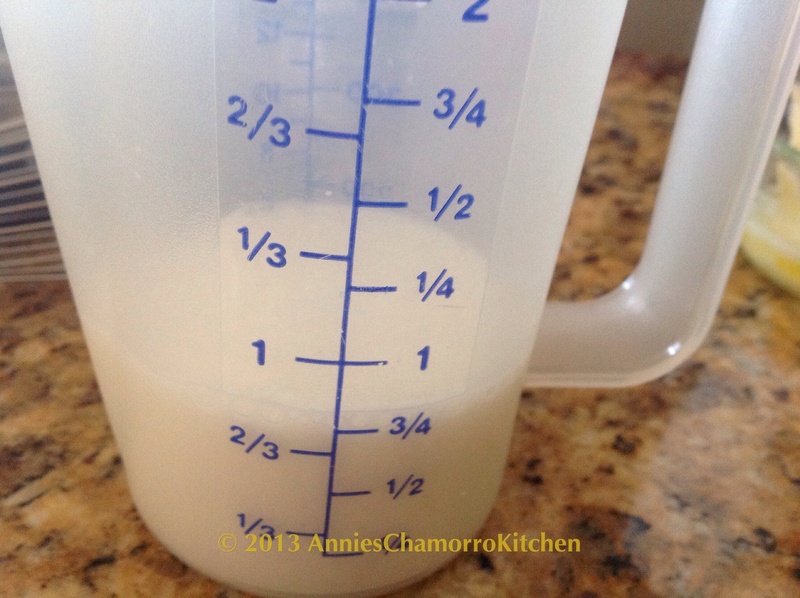 Next, measure out your milk. 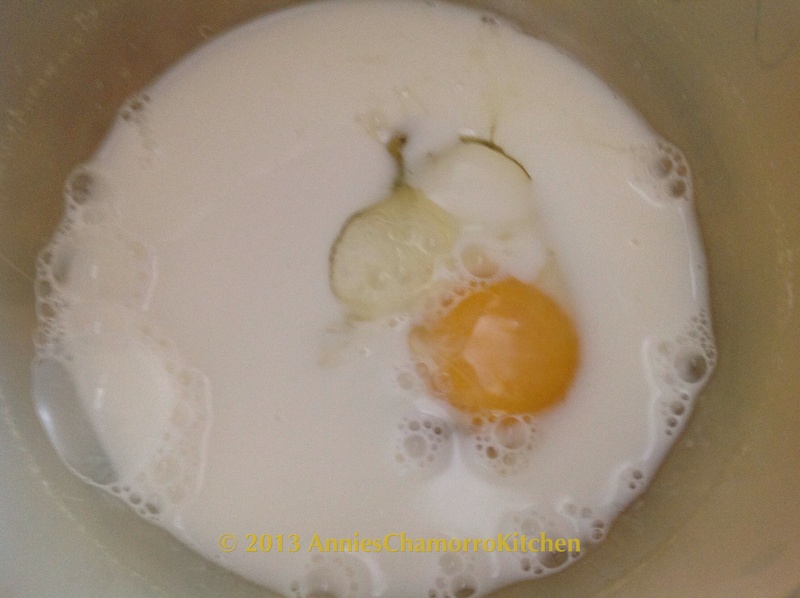 Pour the milk into the bowl with the egg. 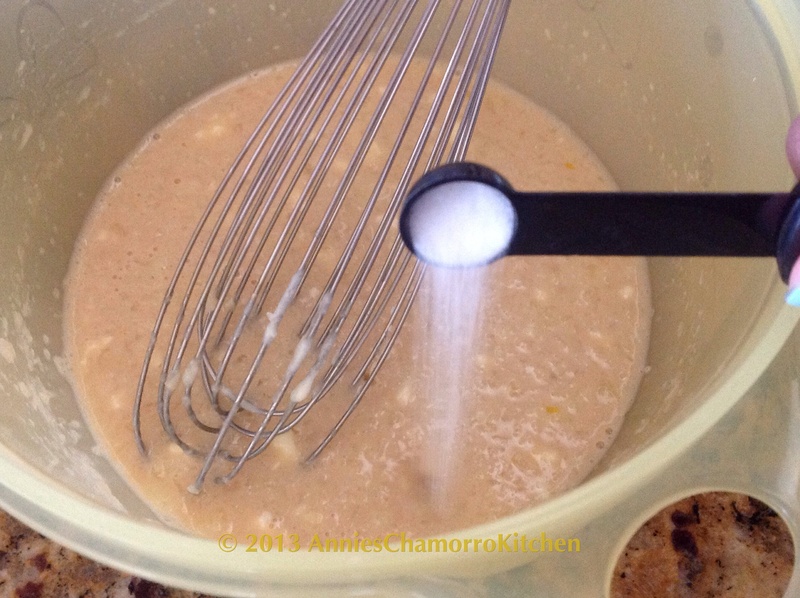 Use a whisk to mix it together. Add the vanilla to the bowl. 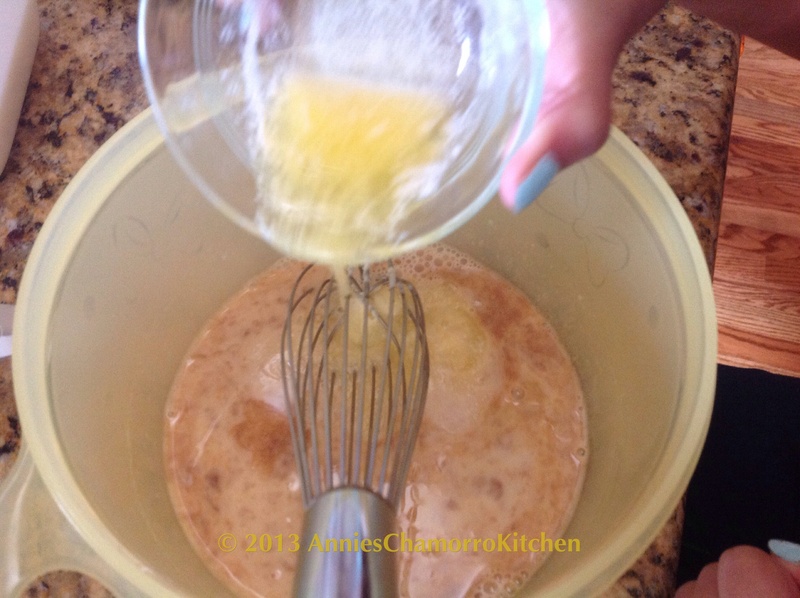 Whisk the mixture together again. Next, melt the butter. 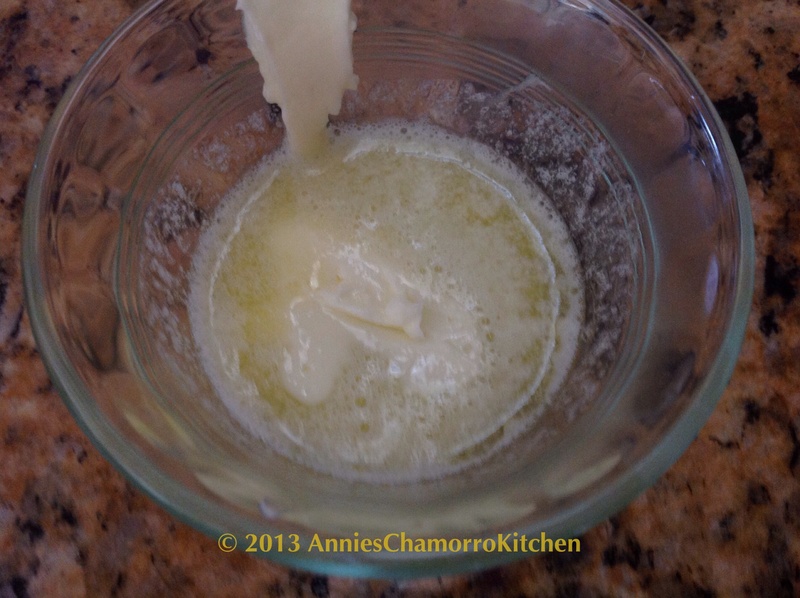 Pour the melted butter into the mixing bowl. The milk was really cold, so if you look carefully, you can see that the melted butter started to solidify again after I poured it into the bowl. If that happens to you, that’s okay. It will all get mixed together in the end. Now the dry ingredients gets mix in. First, add the salt. 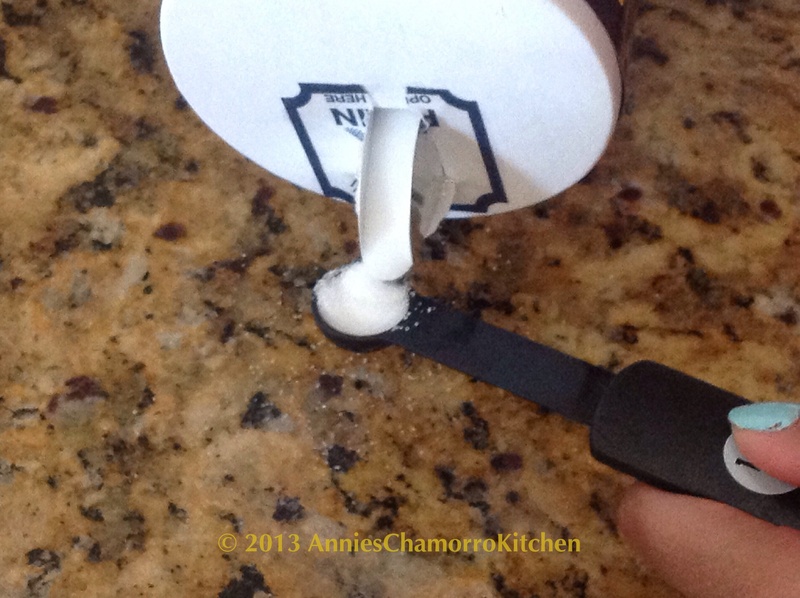 I usually measure out the salt over the counter in case I pour out too much. Salty pancakes would taste horrible. 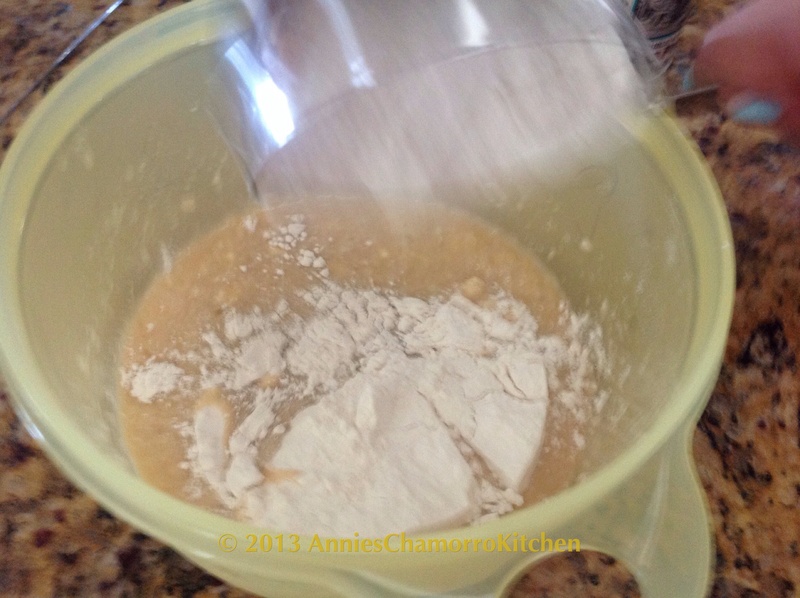 Add the flour to the bowl. 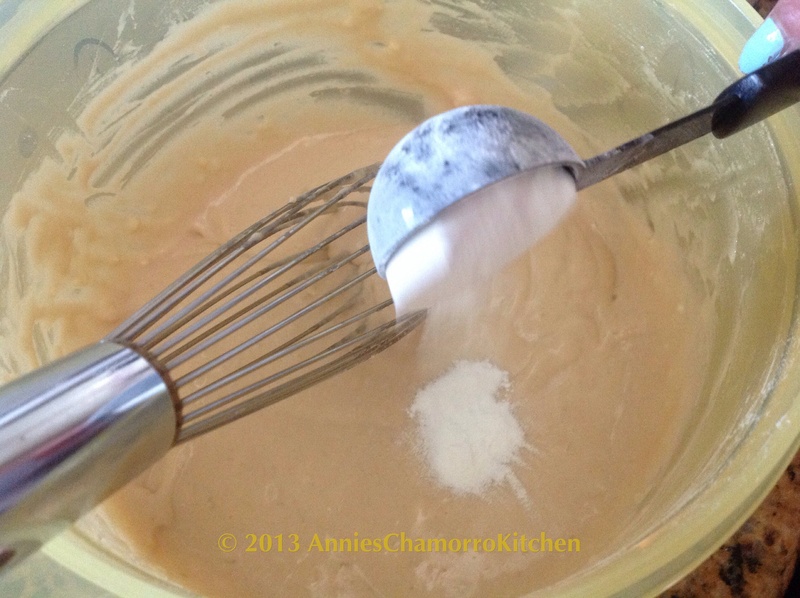 Whisk again to mix the flour into the batter. Add the baking powder last. The baking powder reacts as soon as it’s mixed with liquid. 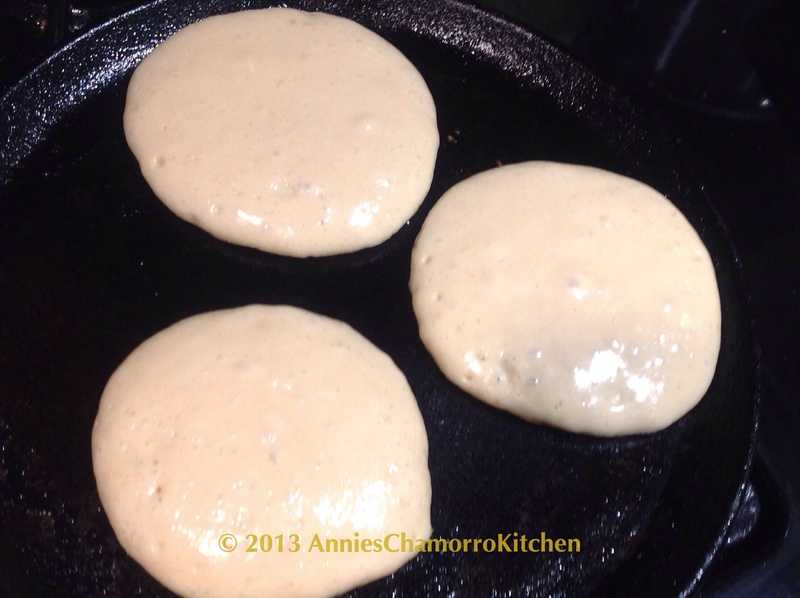 As soon as you mix in the baking powder, get ready to cook up the pancakes. Oh, I forgot to mention that before you add the baking powder, you should start to heat up your pan. 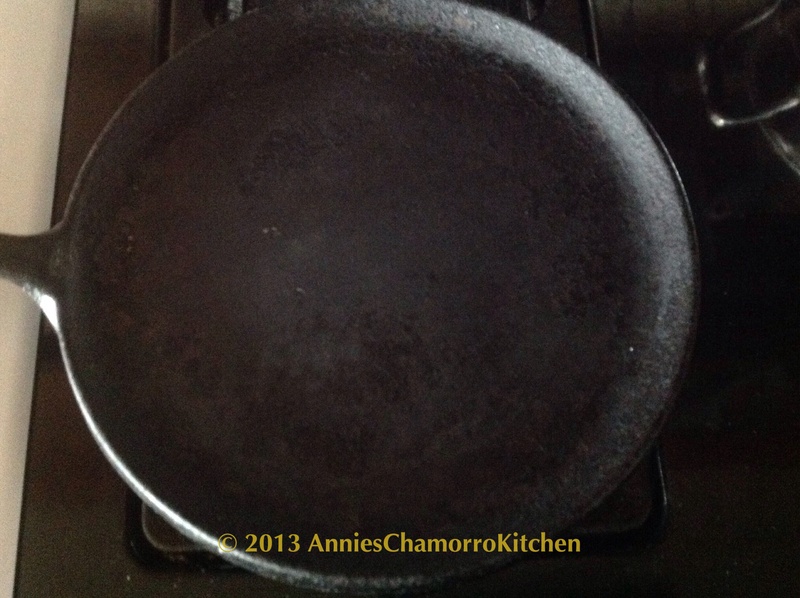 We like using this cast iron skillet. 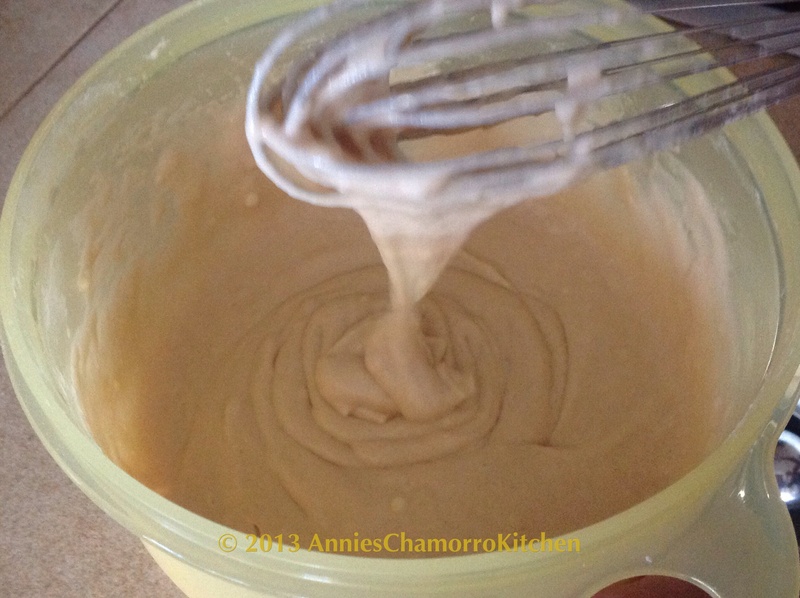 This is what the batter looks like. It should be very thick, not thin and runny. It’s almost as thick as cake batter. 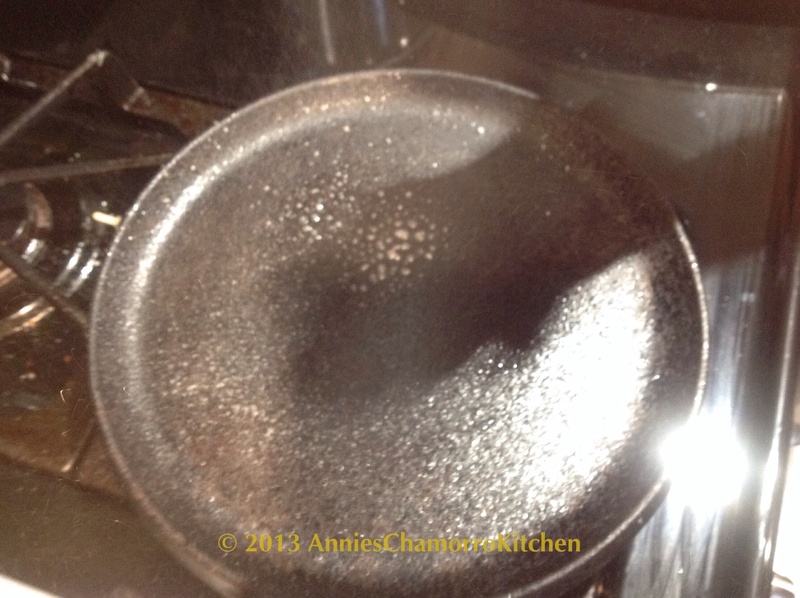 When the skillet is hot, spray lightly with butter cooking spray. You don’t have to use cooking spray. You can use regular butter or you don’t have to use anything at all if you have a non-stick pan. 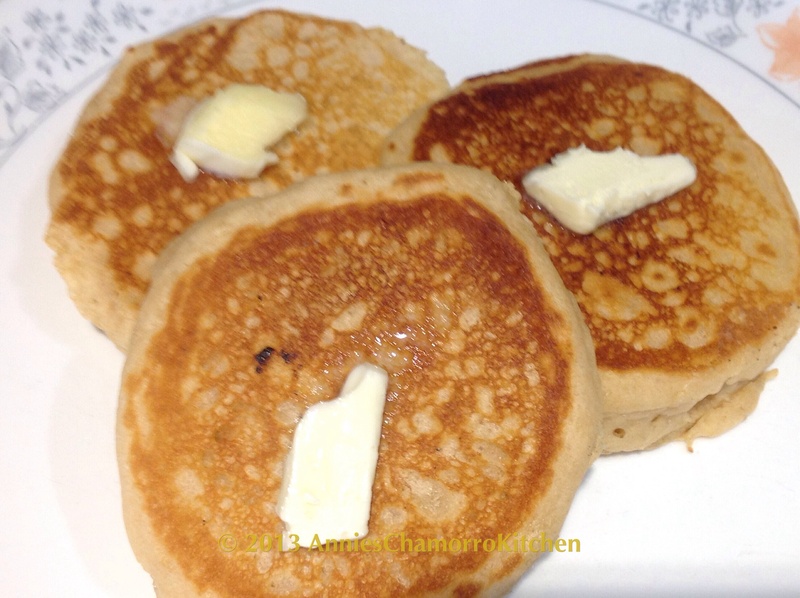 I just like the way the pancakes taste when you use butter to cook them. One of my favorite kitchen tools is a small cookie scoop. 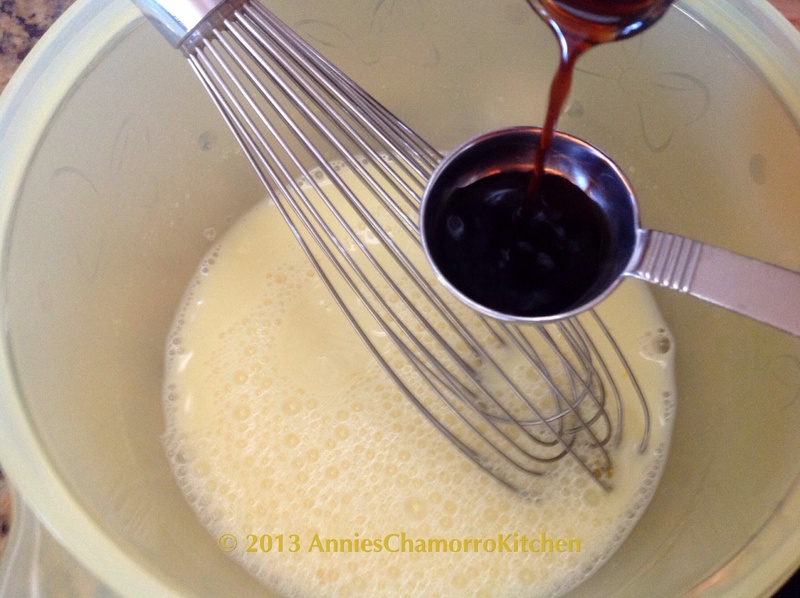 I use a 2-tablespoon scoop to scoop out pancake batter. 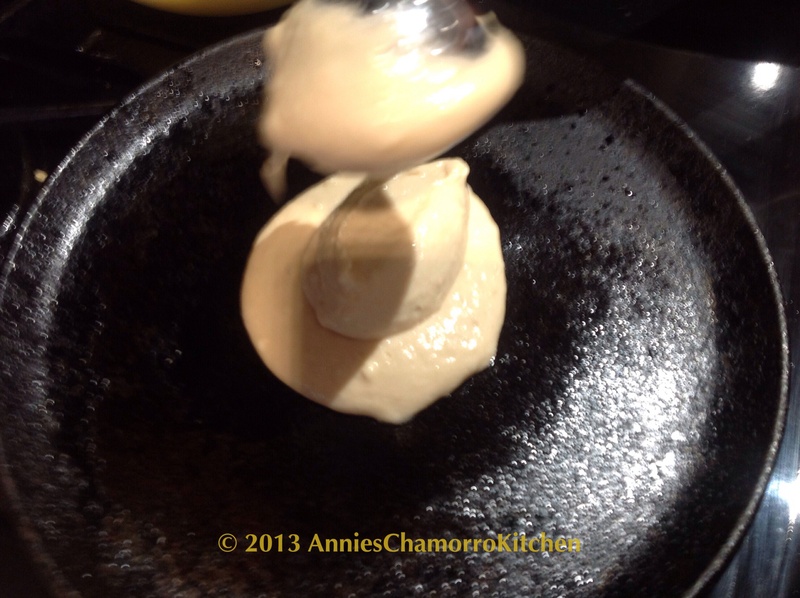 It’s easier than trying to pour out even amounts of batter each time. Plus, it doesn’t make a mess. For big pancakes, scoop out two scoops of batter. You might have to use the back of the cookie scoop to sort of spread out the batter since it’s rather thick. But don’t spread it out too much! 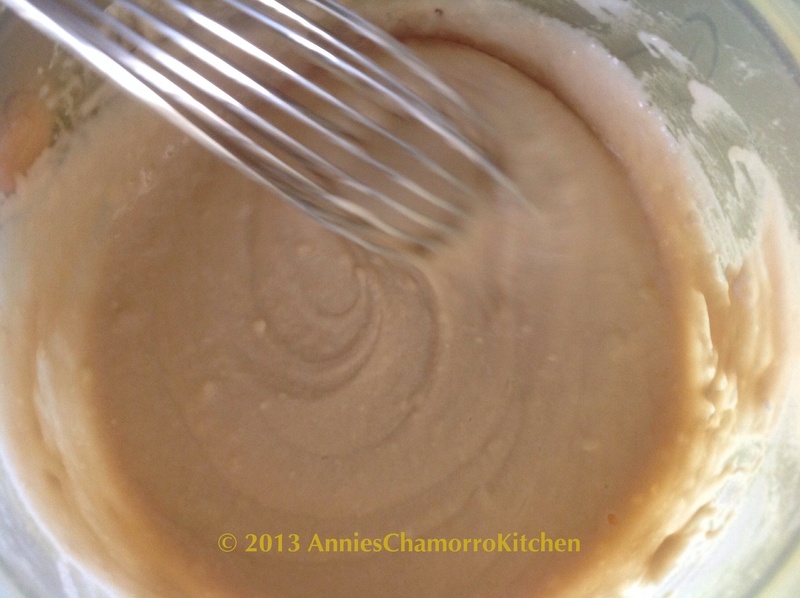 This thick batter is what makes the pancakes really tall and fluffy! 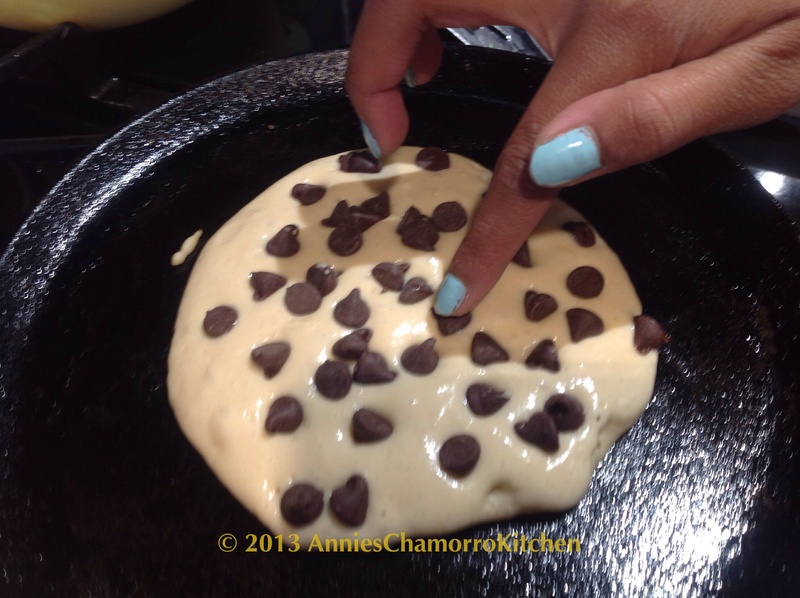 You have to use your finger to press the chips into the batter. 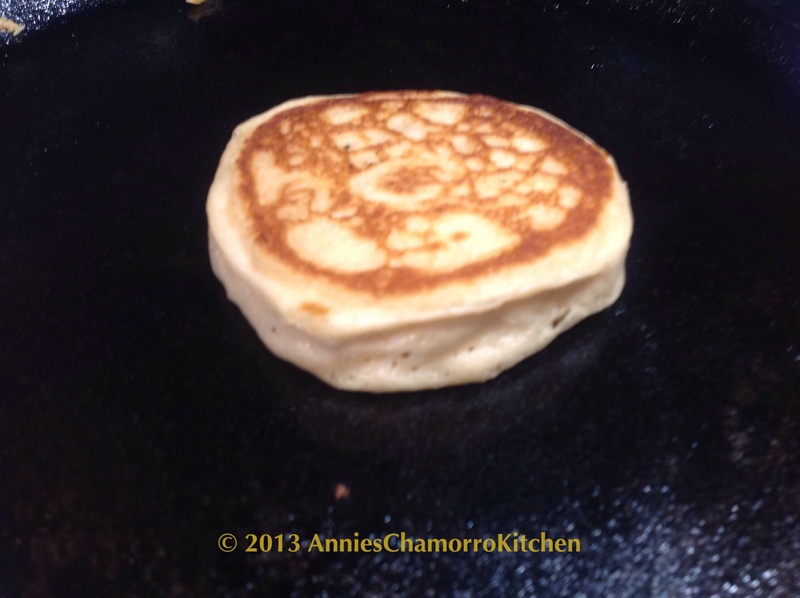 After a couple of minutes, use a spatula to check if the bottom of the pancake is turning golden brown. 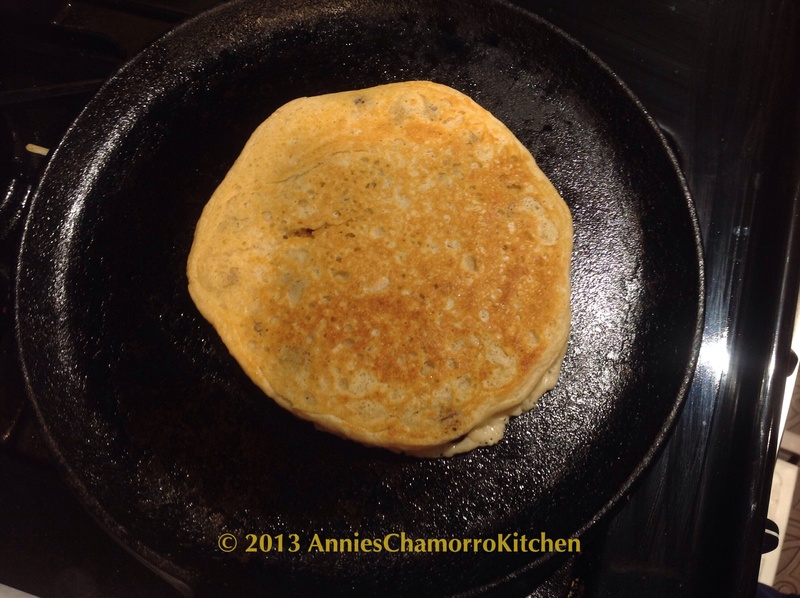 When it’s a nice golden brown, it’s time to flip the pancake. It took a bit of practice to learn to flip pancakes, but it’s really easy. If you’re going to teach your kids to flip pancakes without actually doing it on real pancakes, I recommend using a slice of bread to practice. Practice makes perfect. This reminds me–after practicing and practicing, I now know how to crack an egg with ONE hand and NOT get any shells into the bowl! Okay, back to my pancakes. After the pancake is golden brown on both sides, it’s done. 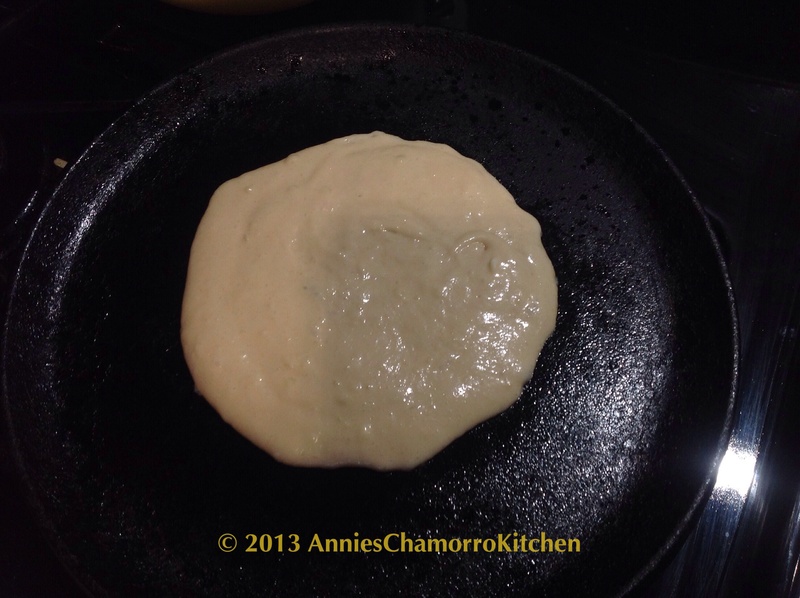 I also press down on the middle of the pancake to test if it’s done–if it feels sort of firm and not squishy, it’s done. Look on the sides of the pancake too. If the side still looks wet, cook it a bit longer. 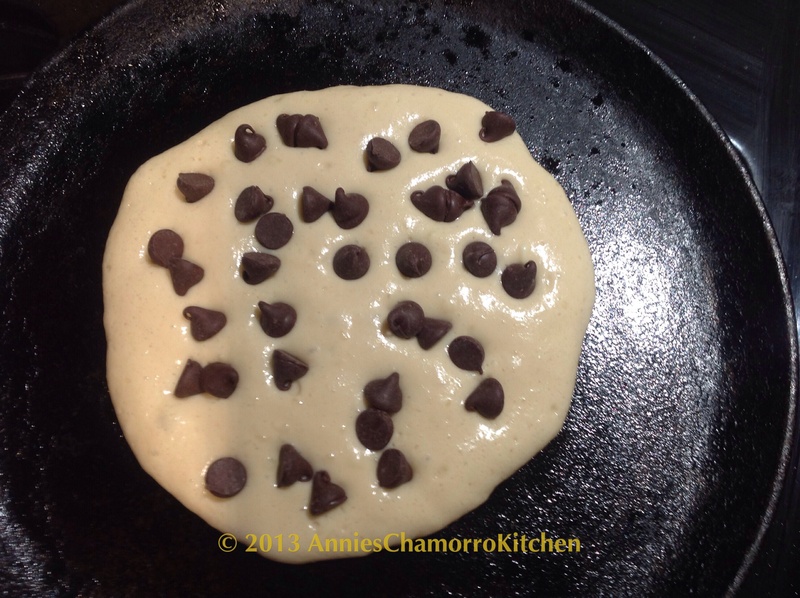 I don’t put any syrup on my pancake when I add chocolate chips, but you can if you want to. My sister likes plain pancakes (without chocolate chips). Today she wanted dollar pancakes. To make small pancakes, just use one scoop of batter. Our skillet can fit three small pancakes. Flip them over when the bottoms are golden brown. 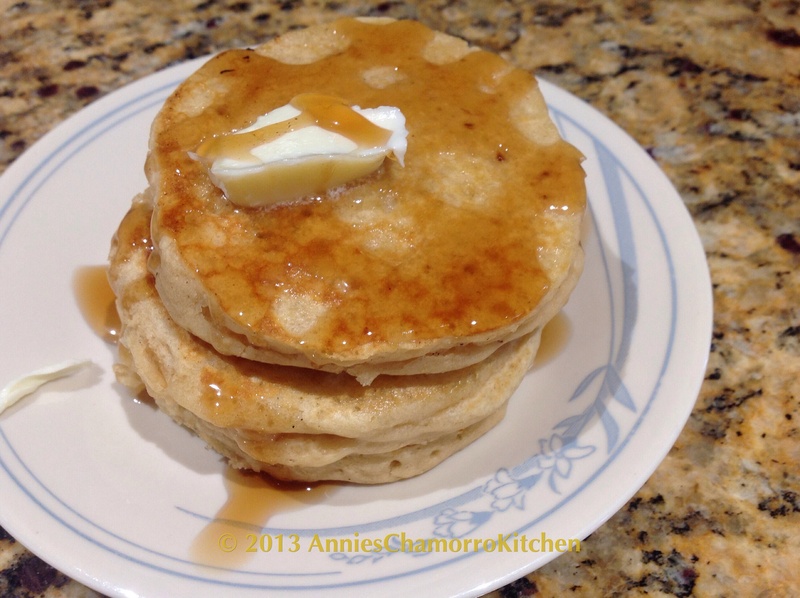 Serve with butter and syrup and ENJOY!! 1. 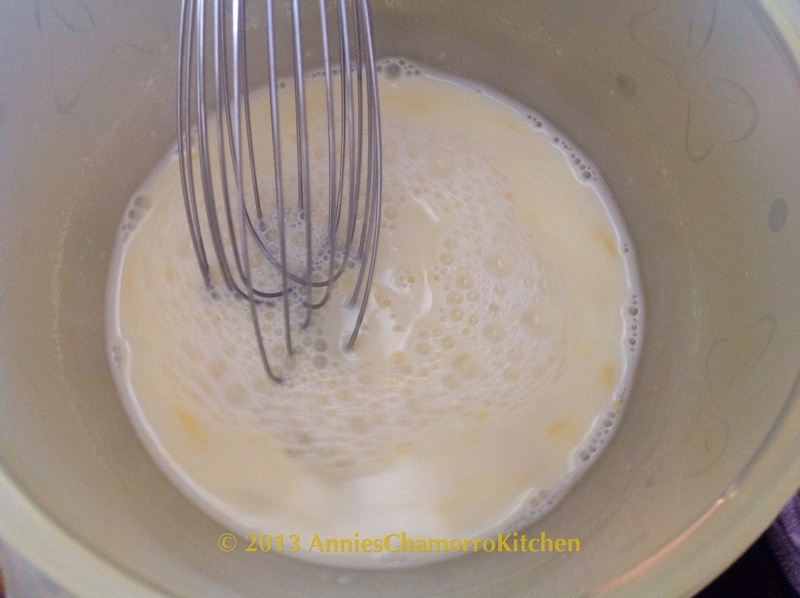 Mix the egg, milk, butter and vanilla in a small mixing bowl. 2. 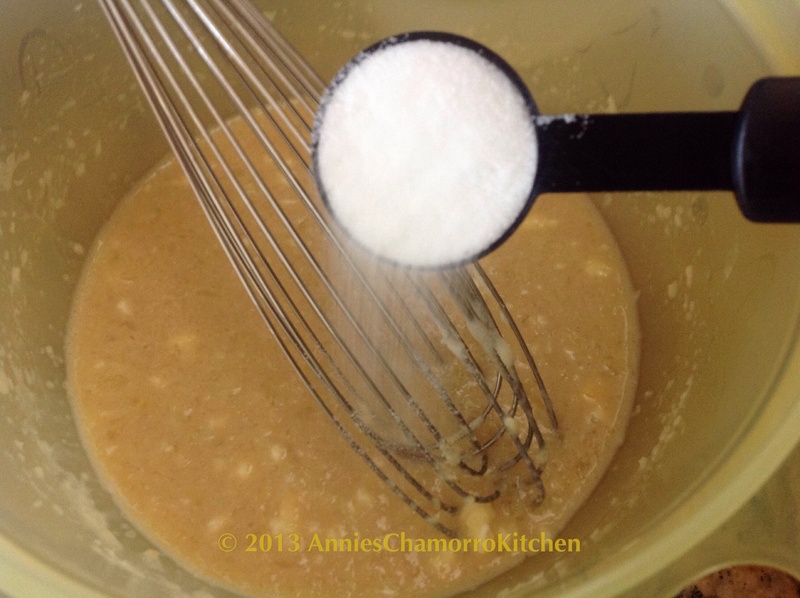 Whisk in the salt, flour and baking powder. 3. Cook on a heated skillet until golden brown on both sides. 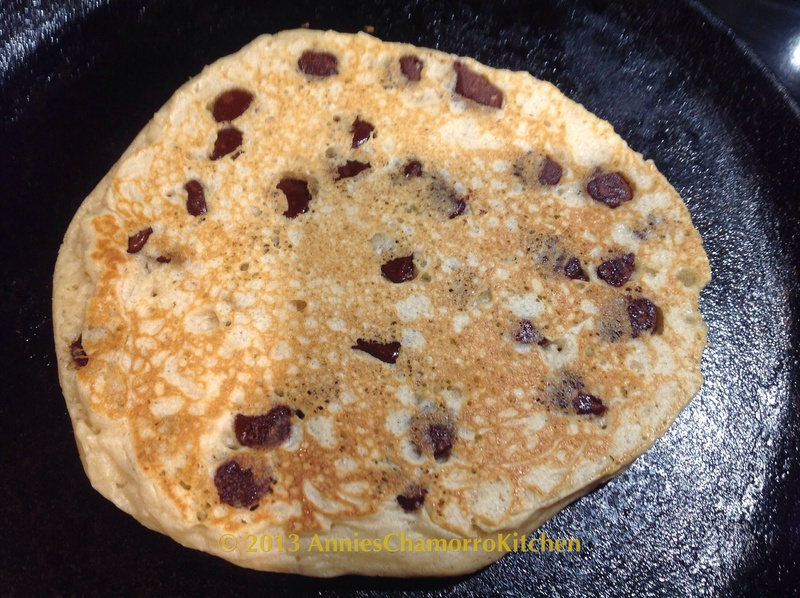 Optional: sprinkle chocolate chips on one side of the pancake before flipping it over. This was delish. I thought the batter wasn’t going to be enough, but it made about 7 medium-sized pancakes. Perfect recipe! Kid approved and will definitely use this recipe from now on. Thanks so much! Looks yummy! I will be trying these – good job!